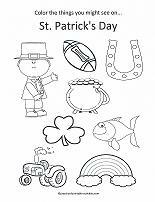 If you are looking for free printables for kids for St. Patrick's Day... here's some fun activity pages. 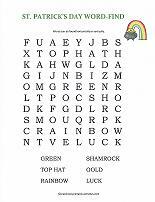 You'll find a word-find, Sudoku, a shape hunt, dice game, maze, a coloring page about the Irish holiday and the Pot-of-Gold Award. An easy word-find with only six words. All words will be horizontally or vertically. No diagonal or backwards words. Know a child who has mastered a skill? 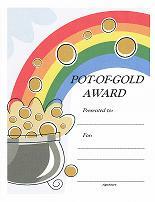 Offer the Pot-Of-Gold Award. Can be used for anything. Learning the alphabet, counting to twenty, learning to tie shoes... or anything else you can think of. Several activities on one page. 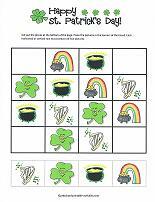 Circle the object that is different, connect the dot-to-dot, color a rainbow, and help the leprechaun find the shamrock. 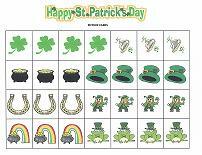 A Sudoku sheet perfect for the Irish holiday. Cut out the pictures at the bottom of the page. Paste each picture in the correct corner. All four pictures should be in each horizontal and vertical row. An easy dice game for two or more players. Shake one die. 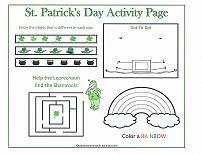 Color the same number of shamrocks on the coloring page. 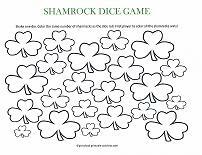 First person to color all the shamrocks wins! 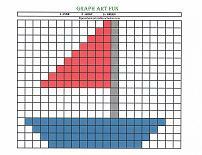 Let the kids use the pattern cards on the right to make the same patterns in each row on the page on the left. 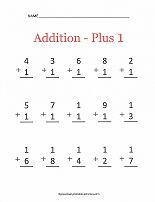 Or... let them use the pattern cards to make their own patterns. Have more than one child? Cut the first page on the lines to form pattern strips to make it easier. A fun shape hunt. Look for the shapes in the box. They are somewhere in the picture. 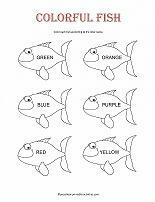 Once found, they can be colored. Color only the shapes. 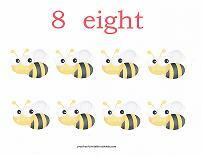 Can the kids find all seven? 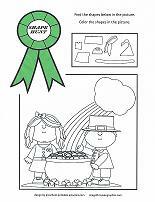 A coloring page that asks the children to color only the items associated with St. Patrick's Day. 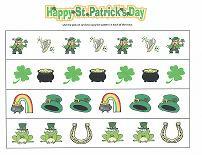 For children who are not yet familiar with St Patrick's Day. this page is a good introduction to the holiday. A fun little maze for St. Patrick's Day. 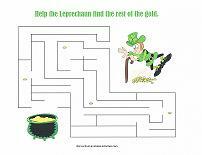 Help the leprechaun find the rest of the gold. Collect some gold coins along the way!